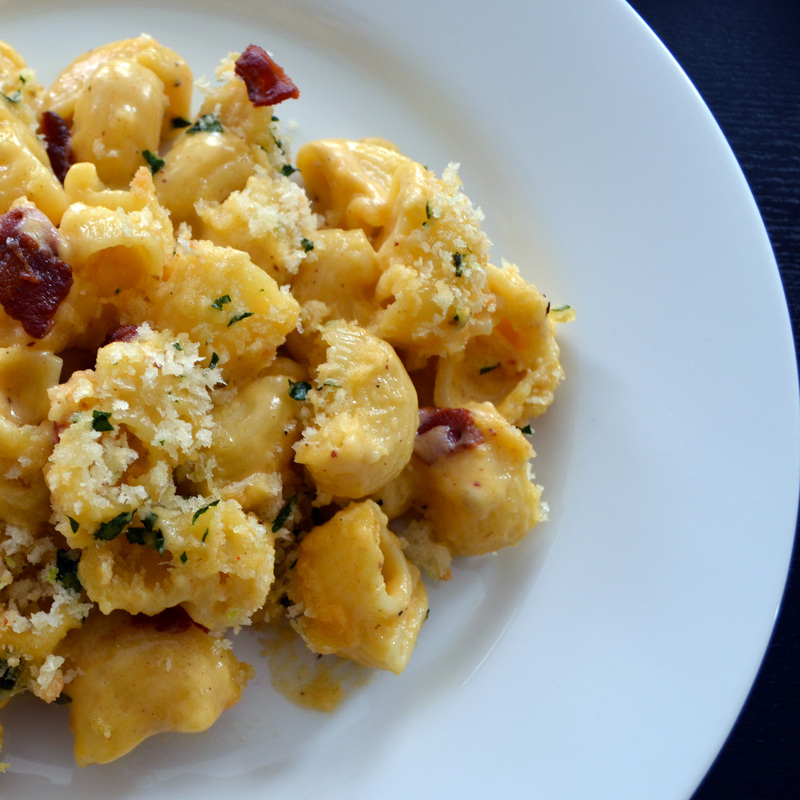 This Bacon Mac and cheese recipe will have everyone asking for more. Knowing there will be bacon and pasta involved my excitement level is one of a child, staring at their presents just before opening on Christmas morning. Is this really happening because it seems so magical. When I see the bubbling and hear the popping sound of the cheese coming out of the oven; while my house smells of bacon. I don’t think any pasta dish gets better then this. I’ve attempted many mac and cheese recipes before, hands down I declare this the best one. I’ve learned a few important steps in making this Bacon Mac and Cheese that can either make it or break it. Thick apple smoked bacon. Not my first choice as a breakfast side, but in certain recipes its a fine gem. Just make sure you cut off the excess fat, cut into even tiny pieces and cook until crispy. The NOODLE! Organic Conchiglie, why you ask. They have the perfect size and shape to capture the right amount of cheese into each shell. When biting into the noodle the cheese bursts out of the shell giving you a life altering experience. With all that said “YES!” this is the best mac n’ cheese ever! You must know when to splurge on ingredients and this is a perfect example of when it matters. Love this dish………the best way to end a long day at work! The first ever comment award goes to… my husband! You won a life time of my cooking! 🙂 Congrats! Love, love, love, this dish. Definitely high quality comfort food. SOOOO… YUMMY! Karolina, I agree! Best mac n cheese ever! Thanksgiving and Christmas must have in my house!! !